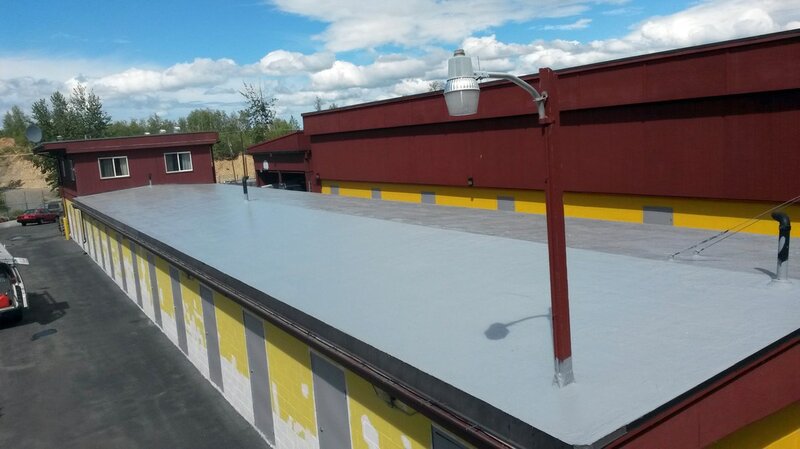 Alaska Roof Coatings is the only commercial roofing contractor in Alaska to specialize in seamless silicone roof coatings. We have been working in the coatings business since 2002 and have a diverse background in managing and contracting carpentry and coating projects. Our mission is to provide residential and commercial customers all across Alaska a cost-efficient roof restoration alternative to the traditional tear-off/reroof. Alaska Roof Coatings is fully licensed, bonded and insured. We live and work in South-Central Alaska. That is why we take pride in the work we do and the strong reputation that it has earned us. Traditional roofing techniques commonly leave seams on the roof. Though reinforced, the seams tend to be the weakest point in the roof and are the cause of most leaks. Our eco-friendly silicone roof coating is applied wet and dries quickly to form a seamless, singular membrane. Water, snow and ice simply bead up and slip away on a smooth silicone coating. We offer the coating several colors, but the most common, and most beneficial, is the bright white coating. The reflectivity of the white roof coating causes harmful UV rays to bounce off of the roof. This reduces the damaging process of thermo-cycling, where the heat of the sun compromises the strength of the roof material through expansion and contraction. ​Alaska Roof Coatings will seal and protect almost any roof substrate including EPDM, concrete flat roofs, modified bitumen roofs, metal roofing, spray foam, smooth built-up roof, wood, steel, single-ply, gravel built-up roof and most traditional roofing systems. Application of the roof coating requires less time, material and disruption than a traditional roof restoration, so you can conduct business as usual. Once the roof coating is complete it holds a renewable 20 year warranty. At the end of the warranty period we will renew the warranty for another 20 years by simply applying an additional coating on top of the initial coating. This can be done over and over, essentially warrantying the roof for the life of the building. We encourage all customers to allow Alaska Roof Coatings to do the yearly maintenance required to maintain the warranty.